Aero Express is an Authorized Distributor for the Barfield 2311FA Test Set. Aero Express will buy, sell and trade the 2311FA depending on your needs. 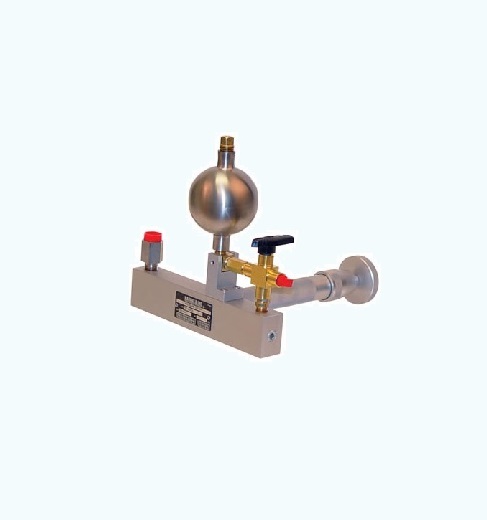 The 2311FA Pressure Tester field tests aircraft pressure systems for both reciprocating and turbine engine pressure systems. It provides pressure for testing pressure transmitters, warning switches pressure-type torque (BMEP) indicators and system leak testing in the range of 0-600 PSI. The unit consists of a cylinder equipped with a manually operated screw piston for developing pressure. A fluid reservoir is connected through a control valve to the pressure cylinder. 1/8 NPT female outlet port is provided for attachment to the unit or system to be tested. The tester is portable and rugged, with a wide range capability. It is simple to operate, self-contained and both line and shop proven. Two types of gauges are recommended and available depending upon the requirements of the user (standard or inspector test types). Standard gauges are available with an accuracy of ± 2% of full scale in ranges of 0-60, 0-200, and 0-600 pounds per square inch (PSI). Inspector test gauges are available with an accuracy of ± ½ % of full scale in ranges of 0-60, 0-100, 0-160, 0-200, 0-300 and 0-600 PSI. The use of VITON (Fluro-carbon) seals on the piston permits the use of any fuel, lubricating or hydraulic fluid. The principal NON-COMPATIBLE fluids NOT to be used with VITON seals are: alcohol’s, aldehydes, amines, alkyl phosphate esters (skydrol), ethers and ketones. Express Calibration an Authorized ISO-17025 Calibration and Repair shop for the Barfield 2311FA. Visit www.expresscal.com for full capabilities.